Apparently, just as the WBC Muay Thai mandate for national rankings will be assumed to be finished a heavy weight world title bout is being scheduled. The heavyweight title by WBC Muay Thai’s ranking has gone undefended since roughly 2008 by incumbent champion Shane Del Rosario. Also further interesting, neither Bosch or Romero is on the WBC Muay Thai ranking for heavyweight with the 20th position being listed as ‘vacant’. How either logically qualifies as a contender for a championship staked fight requires more than a leap of faith. I cannot see WBC Muay Thai allowing this match to happen under their watch and their sanction but as the clock ticks down on the WBC Muay Thai mandate for rankings it could be hard to say how this shakes out nationally. 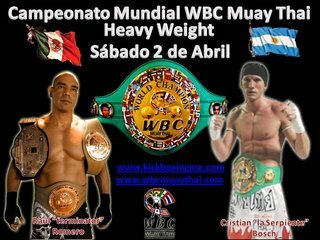 Scheduled to fight on the April 2, 2011 championship match is Argentinean Thaiboxer Christian “Snake” Bosch vs Raul “The Terminator” Romero. Promoter for King Dragon Productions, Oscar Fischer had his own words to describe the title bout. Raul Romero is a Mexican fighter with a long list of fights on his resume but his efforts were mixed with K-1 with a 1-2 record for the promotion. The fights will be in Mexico City, Mexico in the 2015 Revolution Road. The event will be televised by the USA to Central America and transmitted over the Internet. WBC President Jose Suliaman known for offering many interim, emeritus, and other world championship trinkets is also based in Mexico, WBC’s headquarters and home base. Speculatively, WBC Muay Thai has decided to vacate the title and have it contested once more though with 2 non-ranked fighters. Either that or this is an example of ranking not mattering since logically the number one ranked contender Paul Slowinski should have a priority to be matched for the world title first and the title is being used as a trinket and little else. A hand picked list of favored fighters will either emerge or something actually resembling meaningful rankings could appear. We’ll see in time whether this match actually happens and if it is officially sanctioned by any party. ~ by fatsoking on February 2, 2011. Paul Slowinski will fight on March on KSW 15 – MMA event in Poland. That has absolutely no bearing on why the WBC#1 ranked heavyweight doesn’t get a shot at the title he is supposed to. Thanks for coming by and saying….something though.